This is bread that celebrates springtime, the bread we make around Easter in Italy - like an easter egg, this bread is stuffed with surprises - salami, pancetta, cheese, and whole eggs. It is delicious and nourishing and satisfying - everything bread should be! Glance through these pictures as an accessory to the recipe in the post. Who knew that making bread could be this much fun?! 1. 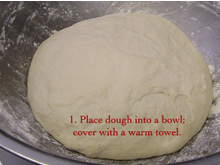 Place dough into a bowl. cover with a warm towel. 2. 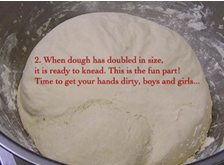 When dough has doubled in size, it is ready to knead. This is the fun part! Time to get your hands dirty, bous and girls... 3. 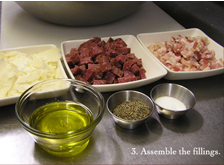 Assemble the fillings. 4. 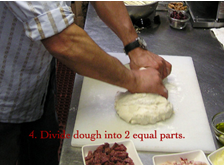 Divide dough into 2 equal parts. 5. 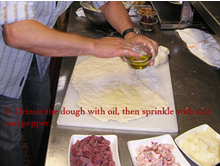 Drizzle the dough with oil, then sprinkle with salt and pepper. 6. 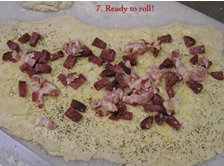 Add salami, pancetta, and cheese. 7. Ready to roll! 8. 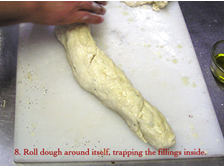 Roll dough around itself, trapping the fillings inside. Bake the loaves at 350 degrees F for 40 to 50 minutes , or until golden brown. Remove the pans from the oven and transfer them to a cooling rack. 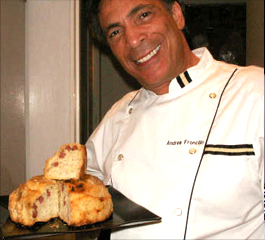 Let the bread cool in the pans for 10 to 15 minutes, then remove and allow to cool completely. Enjoy with your lover and a bottle of red wine.